Are you guys getting academic spam too? I just got this in my e-mail, which is lame-o academic-spam-turned-publishing-hoax. Finally, after getting a number of these, I feel as though academics have finally “made it”; our success is spam-worthy! 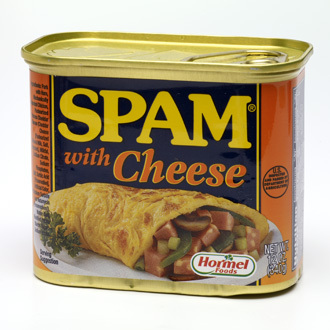 Custom spam, just for us. Are you guys getting more and more academic spam too? Why target academics for this sort of thing? Either we are too dumb/desperate to publish in main-line journals(? ), or, perhaps, we are finally a market worth getting some serious spam(!). I try to be positive about it; after all, what really comes of getting angry about this sort of thing (besides nothing)? Now, we hear about journal hoaxes all the time. For example, the recent case of the recent cancer paper that was a joke or Sokal Affair. Some of these cases, for example, the Sokal Affair are, it seems, hard to forget, given that they helped to trigger the “science wars” in STS. However, what about journal spam? Is anybody actively researching this topic and publishing about it in legitimate journals (there is a post-ironic feel to that sort of work). A brief review of the literature in STS, and the answer is, apparently, no. 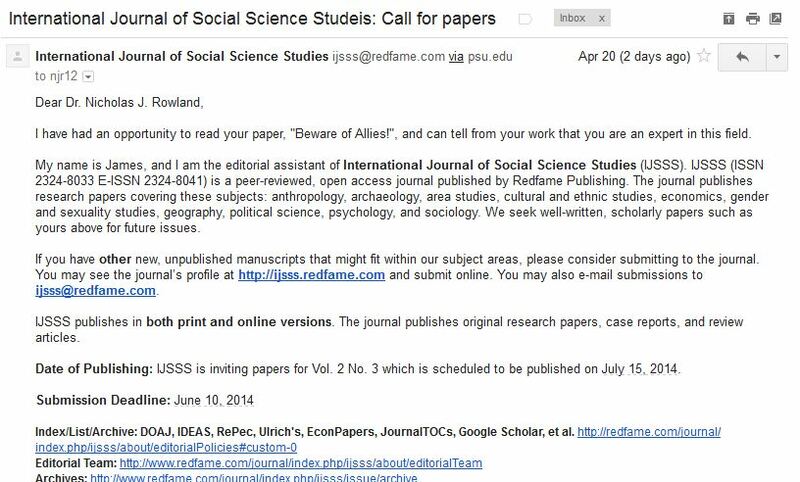 So the answer to the question “Are you guys getting academic spam too?” is surely “yes, we are;” however, we do not appear to be studying it. Author Fee: If the paper is accepted for publication, you will be asked to pay an Article Publication Fee of 300USD. After publication, two hard copies of the journal will be sent to the corresponding author, free of charge. This entry was posted in STS Gossip, The Profession, Uncategorized by Nicholas. Bookmark the permalink. My impression whenever I get these is: “do I look so desperate to get published _somewhere_ that I do not care as long as it looks like a journal?” Then I think a bit, shake my head and read on. BUT: as a topic those venues would be so great. A classic sociology of science, maybe a bit history, not on individual fraud and personal misbehavior, but on scientific shadow institutions and how they try to get you to the dark side. I recently read about conferences organized that way, especially in China, where authors are invited just like in the case you cited. They booked rooms and prepared talks, flew in and suffered jetlag – but there was no conference. Just a bunch of hired supers to fill the room a bit. Welcome to submit papers to International Conference on E-commerce and Contemporary Economic Development [ECED2014], the official website is：http://www.eced2014.com. ECED2014 will be held during 07-08 June 2014 in Hongkong, China. * Innovation Management and International Finance. The proceedings will be published by DEStech Publications.All accepted papers will be submitted to EI and ISTP for indexing. Some excellent papers will be selected and recommended to EI or SCI journals. I totally agree: one angle would be fraud or whatever, turn to a Mertonian norms of science bit. However, the real interest would be to see this as just one of a class of scams that populate what might be called University Shadow Institutions. what about the publish or perish scams going on as part of the everyday bizness of higher-ed in the US? I see them dovetailing nicely; after all, we NEED more journals to pump-out and grind-through all manner of junk being published today that is often of very little use. My mentor used to say: we don’t need a publication base, we need a publication ceiling, meaning, imagine how good scholarship would be if each scholar (serious about publishing or hired by a university serious about it) were only allowed to publish 5 articles in an academic lifetime?